Main body is the same size as our timeless Rucksack. 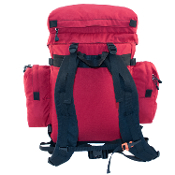 Two zippered side pockets provide storage for water or fuel bottles. Store an axe or hatchet with the forest axe sleeve and lash patch (22" strap included). Top pocket adds aprox. 340 cu.in. Copyright © 2007-2019 Cooke Custom Sewing. All rights reserved.